It was 1991, on the Aegean Sea in a Turkish gullet yacht, I was a ten year-old lad and my irresponsible brother was 17. He was irresponsible because he left his copy of the Viz annual lying around, and, looking like a fun comic, I read it, cover to cover. I’m not saying that my subsequent life has been influenced by Sid the Sexist and the Official Bottom Inspectors, but my language probably has been. 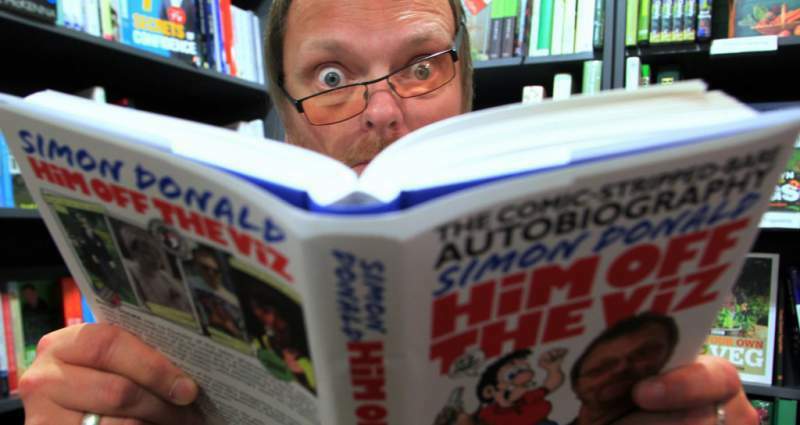 If you haven’t read Viz before, it is a childish, puerile, phallic, lurid and hilarious adult comic, which is also the perfect way to describe Simon Donald, the co-creator. He is going to be doing an intimate (read into that what you will) reading from his autobiography at the People’s Bookshop in Durham on June 21st. Him off the Viz will not only cover the explosion of the magazine’s popularity in the pants of adolescent-minded men and women, but also his own life, which hasn’t exactly been a bed of roses. Following the readings he will expose himself (fnaar fnaar) to the members (giggle giggle) of the crowd by allowing them to dictate (steady) the derection (come on!) of the evening. Seriously though, this will be a small, cosy affair with Simon reading some stories from his book, then some impromptu stand-up comedy, driven by you, the audience, something he is building a strong reputation for. I’ll finish in typical Tony Parsehole style by saying that Simon Donald is truly the autobiographist of hearts, a candle in the comedy wind, burning brighter than the s…(that’s 260 words, invoice in the post). Simon Donald comes to The People’s Bookshop, Durham on Sunday 21st June.